Executives and directors in attendance at the ground-breaking ceremony for the new ExxonMobil Petromchemical plant on Jurong Island, Singapore. 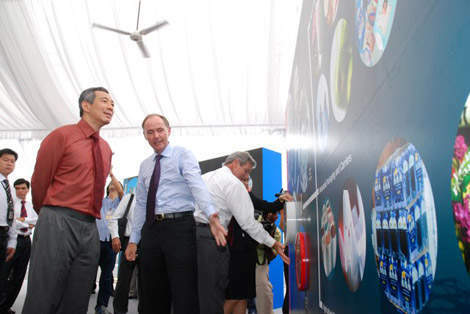 Georges Grosliere, project executive, ExxonMobil Asia Pacific, explains the exhibits at the ground-breaking ceremony of the new Jurong petrochemical complex to Prime Minister Lee Hsien Loong. 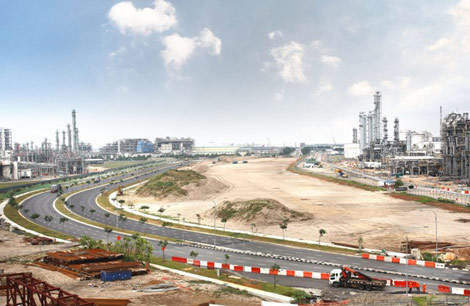 The site of ExxonMobil's new petrochemical plant on Jurong Island, Singapore. Jurong Island is home to about 80 different refineries and petrochemical concerns. 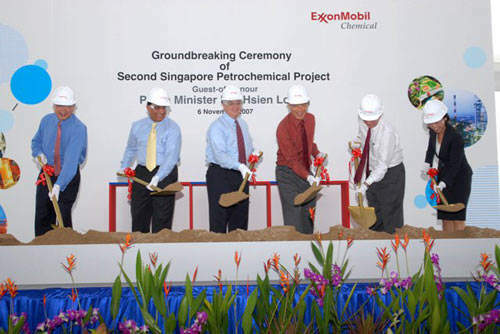 ExxonMobil is set to become the largest petrochemicals company operating in Singapore. The company already has a 605,000bpd refinery operating on Jurong Island, as well as an existing petrochemical plant (completed in 2001, at a cost of $2bn), which has the capacity to produce 800,000t per year of ethylene and has downstream plants to produce polyethylene and polypropylene. The new plant is a multibillion dollar project ($5bn-6bn) that broke ground in November 2007 (the final investment decision was made in September 2007) and was scheduled to be completed by early 2011. However, the project was delayed due to its scale and complexity. The new plant was finally commissioned in December 2012 and the new petrochemical complex is now fully integrated with the existing refinery. The combination of the two petrochemical plants will make Singapore one of the largest chemical-producing hubs in the world. Up to 20,000 personnel were involved during the construction phase and the new plant is expected to generate about 400 jobs. "The combination of the two petrochemical plants will make Singapore one of the largest chemical-producing hubs in the world." The new plant consists of eight chemical-producing units, with the ability to produce a range of basic petrochemicals. It also incorporates units to produce value-added products from these chemicals for exportation to nearby expanding markets, such as China. The new complex has a one million tonnes per year ethylene steam cracker, two 650,000t per year polyethylene units, a 450,000t per year polypropylene unit and a 300,000t per year speciality elastomers unit. The complex is also capable of producing 340,000t per year of benzene from an aromatics unit. It underwent a 125,000t oxo-alcohol unit expansion, a 80,000t per year paraxylene expansion and also houses a 220MW power cogeneration unit. In April 2010, seven furnace modules arrived at the complex. Each module, measuring 50m in height and 2,000t in weight, was installed in the ethylene steam cracker. A special transport vessel, RollDock Sun, was used to transport the units from Thailand to Singapore. The ExxonMobil Petrochemical project makes full use of existing ExxonMobil proprietary technologies to process a number of basic feedstocks into higher-value end-products. The speciality elastomers unit produces the new metallocene-based Vistamaxx speciality elastomers for use in speciality films and polymer modification. "The new plant is a multibillion dollar project ($5bn-6bn) that broke ground in November 2007." The speciality elastomers unit also produces a range of products, including Exact plastomers, which are used in the automotive, consumer and construction industries. The first of two polyethylene units produces metallocene-based polyethylene resins, including Exceed for the production of high quality film for export. The infrastructure at the plant also includes finishing, packaging and shipping facilities. The combination of the original facility and the new facility will enable ExxonMobil to manufacture more than two million tonnes of polyethylene per year. "The ExxonMobil Petrochemical project makes full use of existing ExxonMobil proprietary technologies." ExxonMobil has awarded contracts for different components of the plant. The steam cracker recovery unit and power cogeneration unit design, engineering, procurement and construction (EPC) contract was awarded to The Shaw Group. The steam cracker furnaces EPC contract was awarded to Mitsui Engineering & Shipbuilding and Heurtey Petrochem, while the EPC contract for the polypropylene unit and the speciality elastomers unit was awarded to Mitsui Engineering & Shipbuilding. The EPC for the two polyethylene units was awarded to Mitsubishi Heavy Industries, who are also responsible for the polyolefins finishing, packaging and shipping part of the project. The project coordination and services and infrastructure EPC contract was awarded to Foster Wheeler and WorleyParsons. The process control and instrumentation contract was awarded to Mustang Engineering. 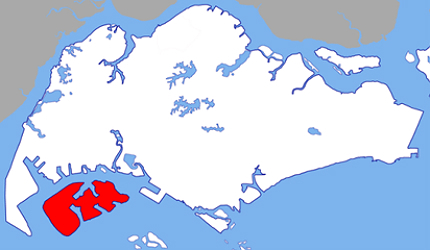 Jurong Island plays host to most of the largest petrochemical companies in the world. ExxonMobil Chemical inaugurated a new technology centre in Shanghai, China in March 2011.